Aisles at Norma Takahashi’s 100-year-old family shop of Hawaiian wonders brim with macadamia nut cookies, sweet-and-spicy scallop jerky, and waterfalls running down bottles of passion fruit ale. In a town of ramen wars, sushi masters, hand-pulled noodles, and 2-hour lines for boba, Asian comfort food is my town’s vocabulary. Takahashi Market specializes in spicy bacon SPAM musubi: a warm, steaming pile of sticky white rice surrounding sauteed SPAM and bacon umami bombs and spicy aioli all bundled up in briny nori seaweed to handily pop in your mouth. Swoon! 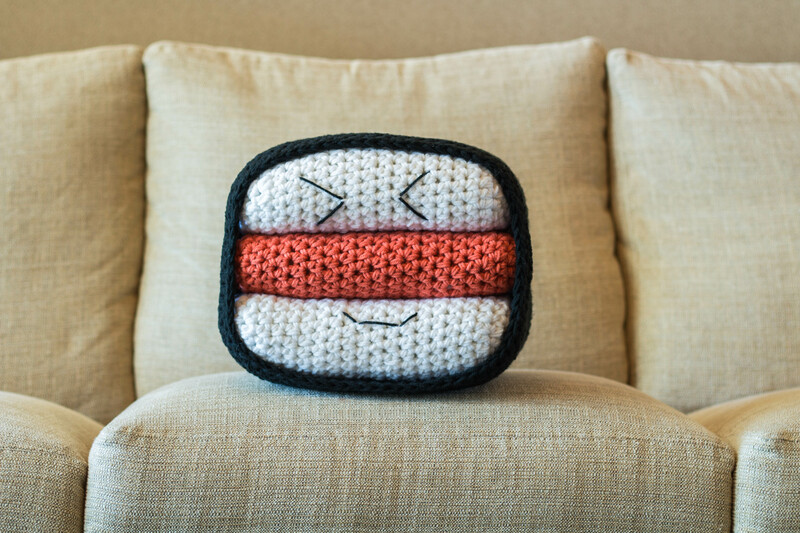 What a delicious inspiration for a new crochet pattern: the SPAM Musubi Pillow. If you haven’t tried this training-wheels sushi, find a Hawaiian friend and ask them if they like SPAM musubi. Go ahead, I’ll wait right here. Let me know what their answer is. I’ll bet you it’s “I lurrrrrve me some SPAM musubi!” Next, invite them over for musubi-tutorial fun, or take them out for lunch at a Hawaiian joint. Soon you’ll be a new convert, you’ll have a perfect thank you gift for your new Hawaiian bestee: a hand made SPAM musubi pillow. Even Martha Stewart proved a masterful SPAM-lover on NPR’s quiz show, Wait Wait… Don’t Tell Me (listen & laugh). This easy project is intended for maximum fun. I designed it as four separate pieces so you and your kids can always play with your food. It looks great with affordable acrylic like Caron One Pound Yarn: if you get it on sale, you can make one on about $10 worth of yarn. A quick, two-evening project, the yarn is held double to work up super fast. Beginners will be glad it uses basic stitches and simple construction techniques. Members of my entourage enjoy a special 2-day offer on this new crochet pattern in their inboxes. Join my entourage here to get in on deals for the upcoming mini SPAM musubi pattern and a SPAM musubi phone case. It’s true, I just can’t leave well enough alone. Hawaii and yarn have become such kindred spirits that Norma and I are scheming market yarn bombs and crochet lessons. Wanted it on my wish list.